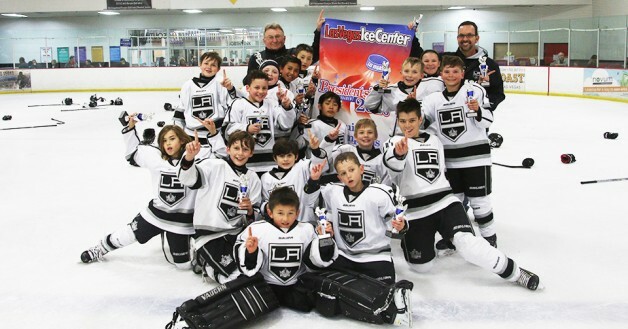 The Los Angeles Jr. Kings’ Squirt BB1 team took home the top prize in its division at this year’s Las Vegas Ice Center Presidents’ Day Tournament, which was contested last weekend. The Jr. Kings forged a perfect 5-0 record at the event, including a 5-2 triumph over the Nevada Storm in the championship game. L.A. opened the tournament with a 2-1 victory over the California Wave, followed by wins over the Storm (5-0), Bakersfield Dragons (6-2) and Texas-based Pond Hockey Club (4-1). Goaltender Nolan Strause came up big between the pipes all weekend, allowing just six goals in the five contests. His brother, Ian, struck for at least a goal in every game, including a hat trick in the Jr. Kings’ first win against Nevada. Defenseman Nicholas Christianson proved to be a force along the blue line and also chipped in offensively, lighting the lamp in every game. Forwards Brian Chun and Kevin Yousefpour recorded five assists apiece.